Dear reader, today's prompt for #OctPoWriMo is about children, and creating a safer world for them. I have not completely followed the prompt, but rather I've looked at an unjust world through someone else's eyes. Through the eyes of a child. Please enjoy. Harsh realities, great job of displaying them. 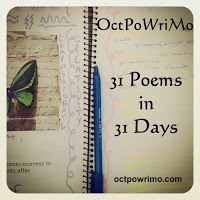 Thanks for linking up with OctPoWriMo. I love the point of view you shared. I love that the last but showed motivation, courage, bravery. Thank you! My details are different, but my story is much the same. Today, I devote my life to giving my own children a very different life. They have much sweeter stories to tell, and, somehow, that is a balm for the little girl I was. Thank you for sharing so bravely! This is beautiful, totally in line with the prompt in my opinion, speaking up fo children, coming from your inner child. I can feel the sadness and the fear. I was a bit like this too.